Shares of Centrais Elétricas Brasileiras S.A. – Eletrobras (NYSE: EBR) jumped more than 40% after the announcement. The stock rallied even though nothing is set. The privatization model and the terms of the deal still need to be settled upon. Additionally, the government retains a right to veto the deal. This deal is likely to proceed with the backing of the government. Brazil’s new president, President Michel Temer, has been working to reform the government. He came into office after the previous president was removed in impeachment proceedings. Among Temer’s goals is attracting private investment to Brazil’s energy and transportation infrastructure. But, as the price move in EBR shows, large privatizations seemed to be unlikely. However, Temer faces a financial crisis. Raising billions by privatizing the utility would help the government close a widening budget deficit and potentially avoid another debt rating downgrade, after Brazil’s worst recession on record. This deal could raise as much as 12 billion reais ($3.8 billion), a government source said. A local investment manager applauded the deal. “It’s a daring move that markets will certainly laud,” said Alexandre Pavan Povoa, who oversees $100 million in assets for Canepa Asset Management in Rio de Janeiro. Eletrobras has faced a number of struggles in recent years. The company has taken on a significant amount of debt. Like many government controlled entities, Eletrobras struggles with operating inefficiencies and investments in plant and equipment tend to be deferred. The company’s valuation metrics are well below a list of seven peers tracked by Thomson Reuters. In a press conference announcing the initiative, the company’s CEO noted that current regulations governing the power industry block the firm’s ability to grow and are responsible for a number of operational inefficiencies. Government ownership has also been a factor that dragged the firm into a series of large corruption scandals. The ownership of the government has also led to many management positions being filled with political appointees who are not always the best qualified candidate for the job. Temer’s predecessor, Dilma Rousseff, made the situation of the utility even worse. She used Eletrobras as a policy tool to fight inflation and spur growth, resulting in heavy losses from which the company has failed to fully recover. Her policies included forcing Eletrobras to take control of money-losing regional utilities and bear the brunt of drastic rate reductions. 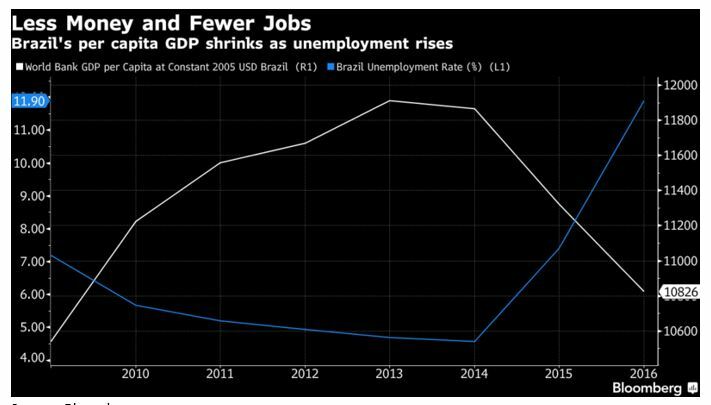 The news comes the same day that Bloomberg published an article describing how bad the situation was becoming, Brazil’s Lost Decade: The Invisible Costs of an Epic Recession. This news is an indication the government agrees, to some extent, and is working to overcome the problems. Economic growth of 7.5% was recorded as recently as 2010. But, the economy contracted by that amount in the past two years. Economic contraction has had predictable results. There has been a contraction in wages and an increase in the number of unemployed. As with so many countries, economic problems are impossible to keep contained within the nation’s borders. In the case of Brazil, the economic problems have led to potentially substantial problems for the global environment. Officials aligned with the World Wildlife Foundation reported an increase in the number of invasions by small-scale farmers and speculators of protected areas in the southern part of Brazil. Deforestation in the Amazon forest surged 29% last year according to official estimates. This appears to be a direct result of budget cutbacks. “One of the main reasons is the reduction of the Environment Ministry’s spending, especially the budget directed to supervision,” said Mauricio Voivodic, the executive director at WWF Brazil. Against this background, the privatization of Eletrobras takes on an added significance. It could be the first sign that the government is seriously addressing the problems and aiming to reverse the decline of the country. Investors in the US can access Brazilian stocks in several ways. Many of Brazil’s largest companies can be bought and sold as American Depositary Receipts (ADRs). An ADR is a negotiable certificate issued by a U.S. bank representing a specified number of shares (or one share) in a foreign stock traded on a U.S. exchange. ADRs are listed on either the NYSE, AMEX or Nasdaq but they are also sold OTC. They trade just like the shares of a US-listed company. A basket of Brazilian shares is available as an ETF. iShares MSCI Brazil Capped ETF (NYSE: EWZ) is a liquid alternative to ADRs or trying to invest directly in the country. EWZ has been in an extended down trend since 2011, reflecting the country’s economic and political struggles. EWZ appears to have formed a significant bottom in January 2016. The recent price action over the past year appears to be a consolidation pattern. The ETF is now trading near the upper edge of that pattern. Based solely on the price action, EWZ is a buy with a price target of about $45, a potential gain of more than 12%. This is a long term price target. To benefit from the potential rebound in Brazil, traders could buy the ETF. The chart indicates a stop loss around $33 should be considered. That makes the potential risk equal to about $7 a share. 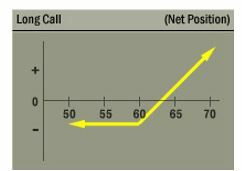 A simple options trading basics strategies to consider when you expect a stock to move higher is to buy a call. This strategy is roughly equivalent to buying a stock. However, the risk is limited. You can never lose more than you pay to buy an option. The profit potential is unlimited, as it is with owning a stock. This makes the strategy appealing to investors who want exposure to a stock but are concerned about the risks. In the case of EWZ, a longer term option could provide upside exposure with much less risk than outright ownership, in dollar terms. A January 2018 call with an exercise price of $40 is trading at about $2.50. This position will cost $250 per contract since each contract covers 100 shares. The risk on the position is limited to $250, less than the $700 risked in buying 100 shares of the ETF. At the price target of $45, this option would be worth at least $5, a value of $500 per contract. That represents a 100% return on the amount invested. Buying 100 shares of stock would also result in a gain of about $500 at $45 a share. However, the return on investment would be just 12.5% on a $4,000 investment. When considering buying a stock, it often makes sense to consider using call options instead. They can provide exposure with a lower amount of capital. Longer term options can be rolled over of the trend moves as expected. And, risks are smaller in dollar terms. There are many advantages and few disadvantages to trading calls instead of buying a stock.